Frosted Lucky Charms, They’re Magically Delicious! When I was a young man, I laughed every time I saw a TV dad depicted as a late evening refrigerator raider. It seemed funny to me that a person would wander into the kitchen late at night just to sneak an oversized sandwich, hoping his wife would not catch him. I don’t laugh at those guys much anymore. Many who know me know that I am prone to getting hooked on just about any sweet. Depending on the time of year I have been known to clear a stack of nutty buddies in two days, can graze on honey nut Cheerios forever, and will chew a hole in the fridge for a fudgecicle. Up until a few years ago I had no fear of gaining weight as a result of my late evening binges. Now; however, things are different and I have the play-doe belly to prove it. My cardiologists recommended recently that I try not to eat so many bad things especially late at night so I began my search for something healthy to snack on. My wife, Toni, is always happy to help and started buying things like carrots, celery, and something called “turkey bacon”, none of which I like at all. She swears turkey bacon tastes the same as regular bacon… I think it tastes like someone sprayed bacon flavoring on a piece of road kill, likely flattened possum. I was having trouble falling asleep about three weeks ago and decided to take an ambien around 9:00 pm or so. I soon fell asleep and to my knowledge, had a good night’s sleep with no incidents. The next day I was doing my honey-do list when I noticed faint giggles coming from the general direction of the living room. I slipped into the room undetected to find my wife and daughters laughing over a Facebook post or something. They were obviously enjoying the entry from someone that had apparently attached pictures. I peeked over her shoulder and to my surprise, (you may have guessed this), they were laughing at a picture of a line of “Lucky Charms” all lined up perfectly in a trail from the kitchen counter to my side of the bed. Each one was about six inches from the other and looked as if Hansel and Gretel had marked the trail out of the woods with them. My wife’s story is that it was me and that she had been picking lucky charms out of the bed for at least twenty minutes earlier that morning. She claims that she decided to take pictures so that I couldn’t deny it. She is such a little gem. Here is my side of the story… She ate the whole box of Lucky Charms and planted that trail conveniently so that she wouldn’t draw attention to herself. Hey, I watch CSI every now and then too! To make matters worse, the night before last she ate a fudgecicle at 2:00 am and left chocolate all over my pillow, not to mention last night when she drooled a half a cup of strawberry yogurt on my side of the bed. Yes folks I am living with the perfect criminal. I don’t think I am eating at night at all. Never mind the fact that she is skinny as a rail and I am blowing up like the kid in Willy Wonka’s Chocolate Factory. Just like with some of our government leadership, the facts mean nothing. That’s my story and I am sticking to it! Well, at least until she catches me doing something else and gets video. 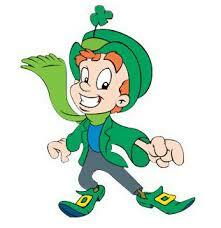 Then I might have to just own up to eating the frosted Lucky Charms. But hey, they really are “magically delicious”.